Talk about bringing your Sci-Fi fantasies to life. Mindlink is a game controller that reads brain-wave patterns. At least that was the plan. In reality it was supposed to be the controller for the Atari 2600. It was not designed to actually read brain-wave patterns; but rather, it was supposed to read muscle movement on the head using infrared sensors and transfer these as movements in the game. Hey, it was intended for release in 1984. 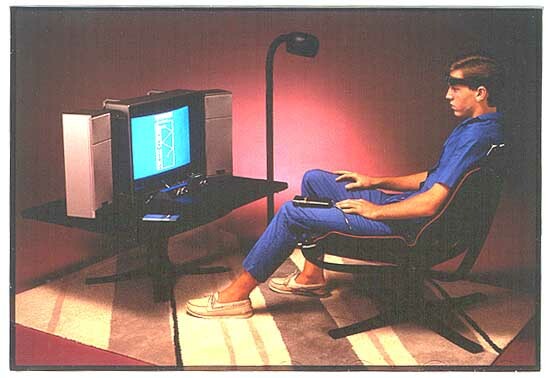 Back then, things like the Mindlink were considered pretty high-tech. Fast forward to the present. More brain-centered controllers have shown some promise. One company, Emotiv, created a buzz at the 2008 Game Developer’s Conference with its skullcap controller, the Epoc. It actually reads thought intensity – and emotional responses and facial gestures as well. Yet there’s no word regarding its release. Another company, Neurosky, is reportedly closer to completing their brain-powered device. The gadget Neurosky demoed at the Square Enix at the GDC 2009 is an on-off switch that reads intensity. Think about something you really like, and it could reportedly be read as you wanting to fire a shot. Gamers are still waiting with abated breath for a release date.